This week I’m presenting a paper to a national gathering of professors who look at messages and sundry forms of communication. My colleague and I are going out on a limb, asking whether some messages—by their very wording–prevent further scrutiny. It’s a bold move. We argue that terms such as Death Tax and Frankenfoods don’t engender more thoughts; rather, they shut down thinking. 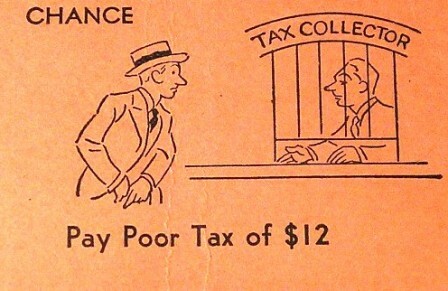 Take the example of the Luxury Tax on the old Monopoly board game. There’s a big fat diamond ring, and if you land on the square you pay 75 bucks. I figure it means that if you have the dough to buy a gem then you have to pay taxes, too. As a kid playing Monopoly, diamond rings seemed to me the purview of the likes of Richie Rich. But by reframing the luxury tax as Death Tax, conservatives effectively changed the focus from rich Americans to middle class Americans, persuading voters that you will be taxed when you die. The Death Tax only applies to the richest of rich Americans, something like 3 percent of citizens. Our paper shows that most Americans despise the Death Tax, but in reality, the tax doesn’t affect most of us. Brilliant framing. Untrue, but brilliant. We argue that such metaphors shut down our cognitive antenna, just like the notion of Frankenfoods ushers in images of Boris Karloff and mad scientists (or maybe Gene Wilder and Marty Feldman). Confronted with a choice between a food associated with Frankenstein’s monster you will likely choose another food. You can’t not think about Frankenstein (apologies for the double negative). Once something is cemented in your brain it’s hard to unlock it, whether it’s true or not. This entry was posted in framing, journalism, news bias, science, science communication and tagged literacy, rhetoric, science. Bookmark the permalink. Enjoyed your continual updates on this blog. Interesting since currently working in Yosemite National Park and have a need to learn “Impact of American Indians”. Not sure if you remember me, but interviewed you in your office for an undergraduate course in 2010 at PSU. Thanks again.